✪ BEST BUSINESS PLAN WRITING GIG ✪ “BUSINESSPLAN” is a group of Professionals poised to help you get your business in the right direction. 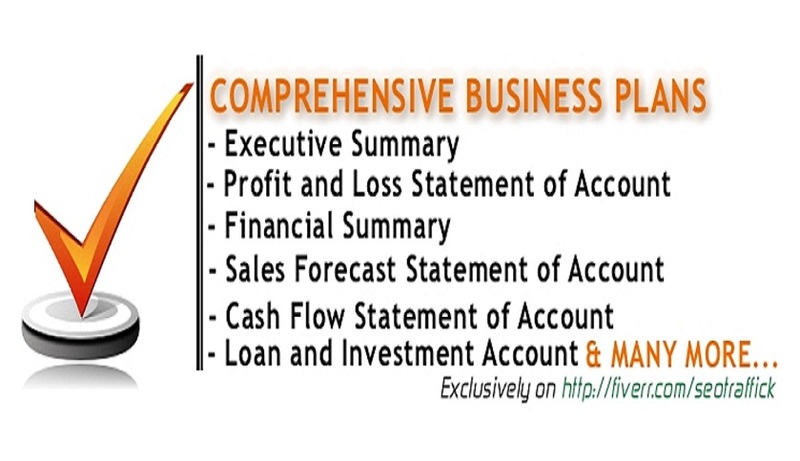 We write complete and detailed business plans of about thirty (30) to forty (40) pages with contents that will include the Executive Summary, Sales Forecast, Financial Summary, Milestones, Company Organization, Strategies that will be implemented for the business to thrive AND MANY MORE. For a FULL BUSINESS PLAN, Order the extra gigs at the rate of just $150 and our team of financial analysts will give you their undivided attention, Full service and support to help you get a standard business plan that will win the heart of your investors. The completed job will be delivered in a Standard, Customized and Confidential PDF Format, Word Format (.doc) and if you need it in an Excel Format (.csv), kindly contact us and we will definitely send it to you. Your GUARANTEED SATISFACTION is our utmost desire. Why not bank on our professionalism to give your business that new face lift……..ORDER NOW!! !